GSIV Prime TONIGHT at 9pm EST! Orbs on sale starting February 4th! 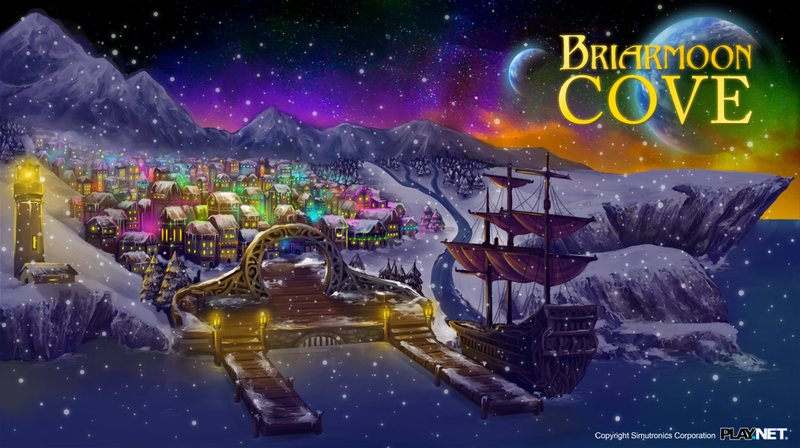 At the frigid and blustery mouth of the Olbin River lies the port city of Briarmoon Cove, cozily nestled among snow-covered craggy cliffs and deep caverns. While easily reached by traders and merchants arriving from the sea, those approaching from the inland trails are met with unforgiving environmental hazards and a harsh, nearly inaccessible terrain, making travel to this area largely unpleasant. Briarmoon Cove has remained a mostly secluded haven for seafaring traders and merchants because of such limited land access... until now! Residents of the town have been preparing for the much-anticipated arrival of visitors, and attendees will be able to experience such things as stunning coastal views of the night sky, street performers, ice sculpting areas, the Lighthouse Pub (best known for its warming spirits), the traveling airship known as The Revenge, and over twenty exclusive shops with wares from Icemule Trace to Ta'Illistim! Isabriel Fain, mayor of Briarmoon Cove, stated, "We have brought delegates from all across Elanthia to our seaside retreat, and they will be marketing quintessential offerings from their homelands. Be sure to stop by shops from each represented area, as you will find a vast assortment of commodities. Some are even exclusive to Briarmoon Cove!" s the festival in Briarmoon Cove approaches, details pertaining to wares and services have emerged. Delegates from towns across Elanthia will open the doors to over twenty exclusive shops, and some will come bearing new items never before seen in Elanthia. You don’t want to miss out! Tired of shopping? Take a break to enjoy “Chisled!” Test your creative skill at sculpting blocks of ice! If you can manage to create something more than a pile of crushed ice, the young artisan may reward your artistic accomplishment with a fun prize. Still looking for more to do? Visit Kotwynn Forest! Amidst the trees, you will find a mini quest that will lead you to the shop “Backwoods,” where you can ooo and ahhh over Toku’s never before seen Forest Armor!